Binder containing 453 slides/transparencies (35mm). plus about 8 rolls of developed b&w and color negative strips of entertainers, celebrities, singers and sports stars (mostly multiples of each subject) from the 1970s and early 1980s, made by noted celebrity photographer Richard Bocklet. Images are candids made at Academy Awards nights, movie premieres, openings, parties, dance galas and other social gatherings. 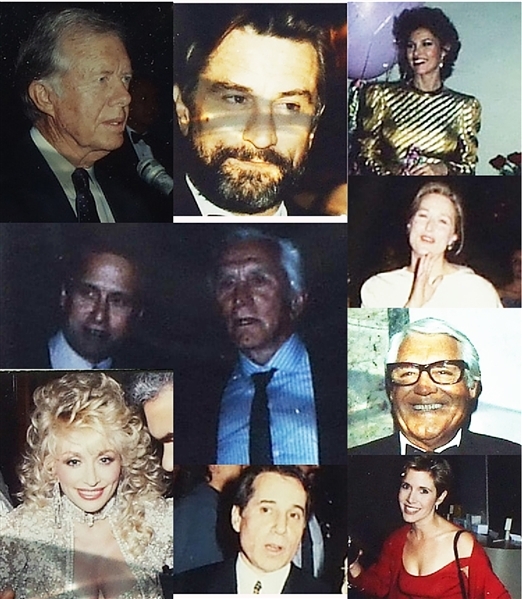 Images include: John McEnroe and Tatum O’Neal, Michael and Kirk Douglas, Mia Farrow and children (many), Robert Downey Jr., Robert DeNiro, Jimmy Carter, Israeli PM Shamir, RFK Tennis Event, Mariel Hemingway, Joel Gray, Raquel Welch, Brooke Shields (many), Alice Cooper, Bobcat Goldthwait, Calvin Klein, Lee Radziwill, Paul Simon, Penny Marshall, Carrie Fisher, Julian Lennon, Meryl Streep, Robert Plant, Dolly Parton, Bette Davis, Jimmy Stewart, Nancy Reagan, Julia Roberts, Cary Grant.